On the first of the two days, I checked that the maritime weather forecasts the next day were still going to be very good and indeed it turned out that they were and would not replicated for some 4/5 days afterwards. Kathleen and I debated the options and concluded that, whilst we did not really want this holiday to end, it had gone on for far long enough and so we should get back to tackle some of our other responsibilities. The decision was therefore made for us cruise back all of the way home tomorrow. I reckoned that low tide at Great Yarmouth was timed for us to pass under the Bure Bridges with enough daylight to cruise all of the way back to Horning before too late in the evening. I then had to do some serious cruise planning when it turned out that we would need to leave before 6am local time from Ipswich and, because Kathleen was not willing to do that, I somewhat reluctantly decided to unmoor and cruise through the lock on the first day and then moor up for the night at Woolverstone Marina to eliminate the risk of possible Ipswich lock delays and allow us to get up and leave an hour earlier. I calculated that we could now be home in Horning at 7pm tomorrow and, after checking with Norwich City football club about tickets for the cup match tomorrow night, I bought one on line and now stand a good chance of being able to attend it. 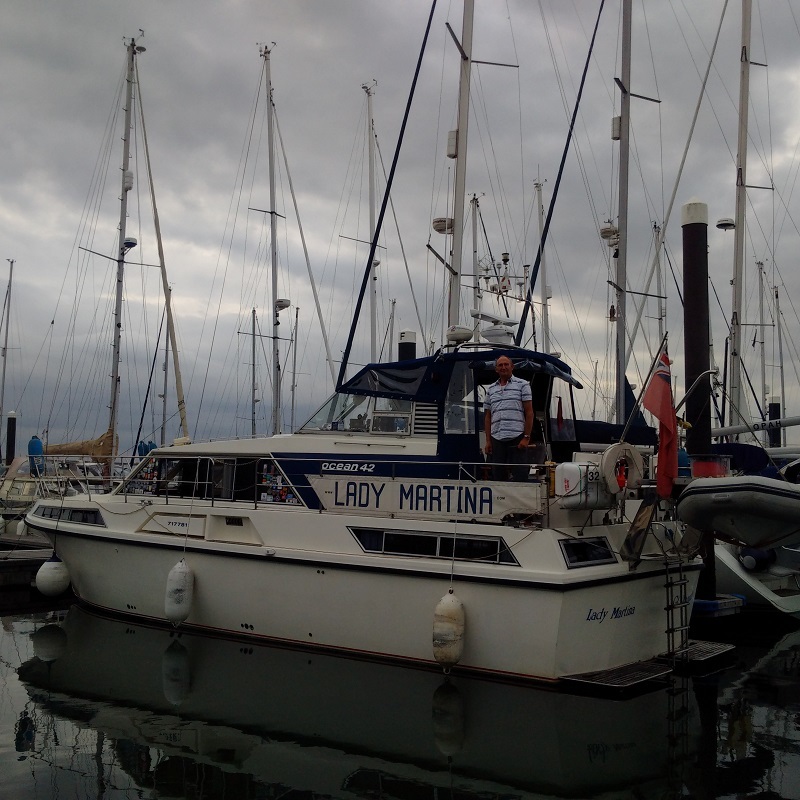 There then followed that short trip through the lock to moor for the night at Woolverstone Marina and then a flurry of efforts once there to plan the cruise and prepare things for our home-coming the next day. I had booked a Haven Bridge lift for 4pm and had also spoken to the Great Yarmouth Yacht Station rangers to check my timings and so everything was in place. I updated my weather forecast information and it was still looking very good as we ended the day in still conditions on the river marina at Woolverstone. On the second day, I awoke early to find the conditions absolutely dead still and the water in glass-like condition and that prevailed for much of the day. I still went on line and checked all of my weather forecast sources and established that it would deteriorate later but only after I had arrived off Lowestoft and Yarmouth later this afternoon but there was no way we could bring the voyage forward. Even by going faster, our Haven Bridge lift was scheduled for 4pm and, even if that could be brought forward (and they would not when I asked them later) I would still have to wait for the tide to drop enough for me to get Lady Martina under the Bure bridges! I pressed Kathleen and worked quickly to prepare for our voyage such that we started a half hour ahead of schedule just in case. She could then carry on with the preparations down below as I took the helm and cruised at a steady 6knots down the Orwell. I was expecting the calm conditions to deteriorate once we got to Harwich and then in to the open sea but they did not as the breeze from the north-east was only 1-2 knots and did not rise above 5knots all day and so I kept cruising slowly at 8knots and took the shorter route across the shallows known as ‘The Platters’. Though a very shallow option, the tide was making all the time and I had no less than 5m of depth under my gauges as I kept close to the Suffolk coast. It was interesting in these mirror-like conditions to see the ripples associated with the ‘humps’ in the platters which I avoided for even greater security. The cruise then took us onward past the Deben estuary, to which lots of be-calmed sailing boats were headed with sails stowed and under power, and then past that of the Ore until we passed inshore of the Whitley Bar sand bank and along the Hollesley Bay Channel close in to Orfordness and it was strange to see how calm the water was so close to this prominent headland which would be a very different experience with strong winds and tides in opposition if conditions were different. It was a long slog at slow speed and, with Kathleen returning to her bunk to catch up on more rest, I occupied myself calculating our progress against the schedule which would enable us to catch that bridge lift and access to the Broads and the Bure. We had some strong tides propelling us forward and so it was tough watching our progress delayed and trusting that mother nature would propel us to our timely arrival in Great Yarmouth. I kept my nerve and Lady Martina’s course and speed steady as we passed Aldeborough, the huge Sizewell power station and then Southwold before that tide turned and we were virtually surfing along as we approached Newcome buoy that marked the dog-legged entrance to the Yarmouth Road which joins Lowestoft and Yarmouth and is sheltered within the off-shore sand banks. It was at that point that a succession of fast Catamaran wind farm service boats started to arrive, speeding past us quite close and pitching us about with their wake. I could only cope by steering away and then back across their wake to take it on the bow and, by thus zig-zagging, it was a job to avoid them all as there must have been six of them one after another. I took to the VHF channel 14, knowing that they must be listening, asking Lowestoft Port control if it was necessary for them to be coming in at such speed and within 1-2 cables of me. They predictably replied that there is nothing that they can do, the vessels being in the ‘open sea’ but I reminded them all that it was still for skippers to proceed with ‘due care for the safety and consideration of others’ and I hoped that they would take the point. I then found that we were a full hour early with regard to my schedule and phoned Yarmouth port control to see if they could bring the bridge lift forward as I was then the only vessel requiring it, and when they could not I then radioed Yarmouth on VHF Ch 12 to ask if I would be in the way proceeding slowly up their channel to mark time. They replied that I would be in the way as there were lots of ship movements and so I then proceeded up Yarmouth Road at a virtual tick-over speed of 3 knots to maintain steerage and still found the tide whisking me along at over 6 knots! There then arrived the thunder storm that had been predicted and a deluge of rain followed, preventing us from lowering our canopy before the bridge and necessitating both Kathleen and I donning waterproof coats, leggings and boots! I got Kathleen to remove all vulnerable carpets, cushions and unnecessary belongings from the bridge and put them down below as I judged my arrival and got permission to enter through Yarmouth Piers at about the right time and made my way up through the long inner harbour listening to the radio and the arrangements for the bridge lift. Two sailing yachts had been talking to Breydon Bridge about using my lift to proceed downstream and moor at Town Hall Quay un-be-known to the Haven Bridge lift crew and so I informed them and suggested that they come down first with the fast flow and this they did, slightly delaying our passage. The tide was racing down through the open bridge and we needed a little power and careful steerage to pass safely and then I engaged the auto-pilot at slow speed and stemmed the tide so that Kathleen and I could put covers over the instruments, remove the canopy, winch gantry and flag-staff and then lower the mast and windscreens to make Lady Martina ready to negotiate the Bure Bridges in the pouring rain. I had been in contact with the Broads Authority rangers at Yarmouth Yacht Station and there had already been more than 10ft of bridge headroom registered there on the gauges and the gauge downstream of the Vauxhall Bridge was reading over 11ft (8ins more than the 10ft 4ins that I needed) as we punched the ebb tide up the Lower Bure when the rain cleared and we could start getting Lady Martina back to normal. 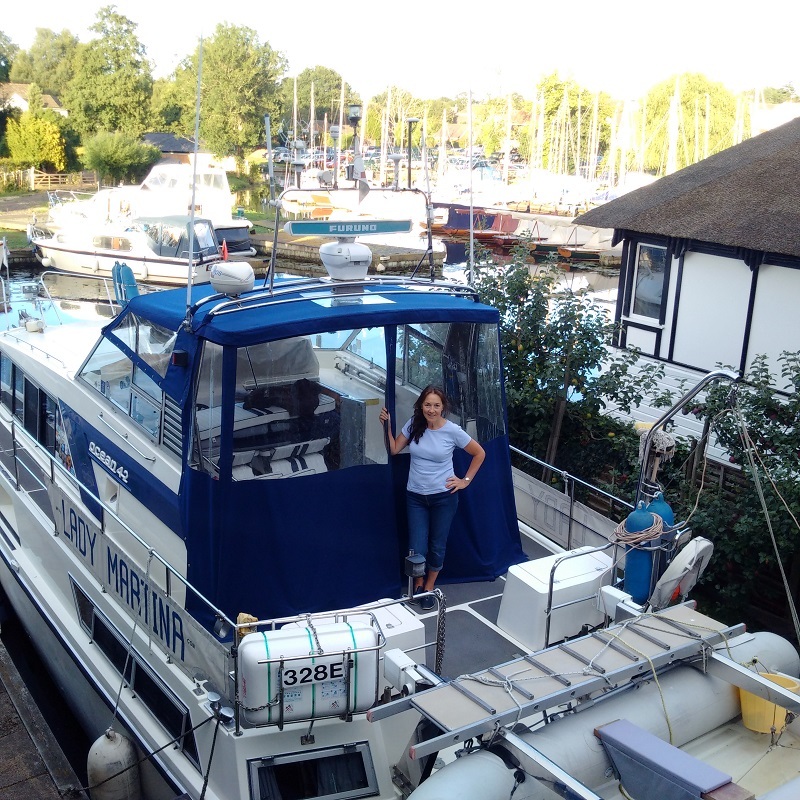 We had to keep things down until we reached Acle Bridge and could then reverse our efforts to raise the windscreens, the mast and fit the canopy as I still pressed on with the autopilot adjusting our course at the same time! 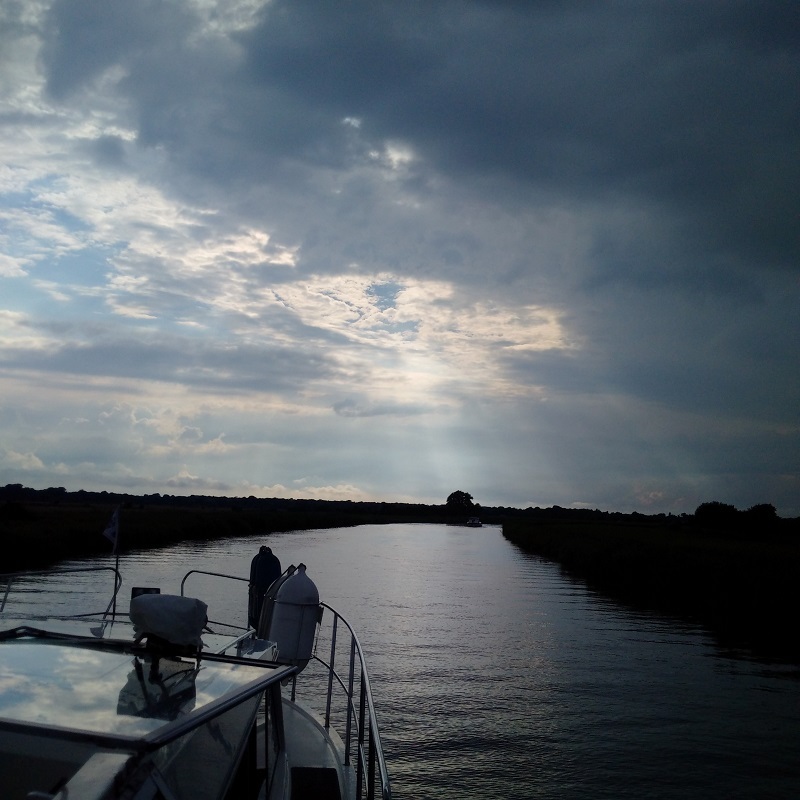 There then followed the long cruise against the tide up past Stokesby, Thurne and then into Horning as we tidied the boat up and I changed ready to race off for the football!